Here is the list of "Top Rankers in Heat Transfer" skill, who has shown an outstanding performance in "Heat Transfer Certification Test" from Sanfoundry and have scored either Grade A* (Genius) or A (Excellent) and earned a "Certificate of Merit" for themselves. Certification on Heat Transfer is substantially useful for everyone in their Professional Career growth. They can readily showcase their certified skill on Heat Transfer topic during job interviews, career discussions and career progressions. We have also listed down the names of all the people who have taken our Heat Transfer Certification Test and have passed the test. So, scroll down the list below and check your position. The list is arranged in descending order of overall marks obtained by the candidate in the test. In case you would like to attempt all types of tests (Practice Tests, Mock Test) or read 1000 Questions on this topic, you can start here or here respectively. 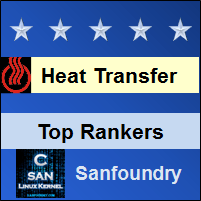 Here’s the feedback from Top Rankers in Heat Transfer. Sanfoundry Certification test is quite challenging, I prepared for the test through my notebook, some books, by giving several mock tests and watching some online webinars, Sanfoundry certificate would help in achieving my future goals, also this Certification Tests helps me to build up confidence in the respective subjects. Sanfoundry Certification Test is one of it’s kind and it has proved to be really beneficial to me. I prepared for it through certain books as well as referring to a few academic websites. Sanfoundry test helped me to enhance my knowledge and I am sure Sanfoundry Certificate would help me in my future endeavors.